Hotel El Mirador del Pacifico is located in the central pacific region of Costa Rica, in the Manuel Antonio / Quepos area and is a short distance to the beach. Our property has over 14000 m? 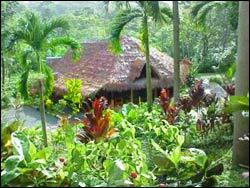 of tropical foliage and primary forest where you can see a variety of animals and plants. The monkeys visit us often as they make their rounds through the forest as they like the different fruits and almendro nuts which are available here. Make yourself at home in this tropical paradise in either the hotel or one of our fully equipped villas. Great Fishing! In the great outdoors! In a gorgeous, jungle setting, with your favorite drink and food! That's Hotel El Mirador del Pacifico! What more could you want? Yes, we have all the other Costa rican nature activities, but we're especially convenient to the charter fishing services in Quepos. Let us help you have a World Class Sportfishing Adventure!